One-stop information resource and overview of the historical, demographic, political, and cultural issues that make up today's diverse Asian American community. You can think of Asian-Nation as an online version of "Asian Americans 101." AsianWeek, based in San Francisco, CA, is the oldest and largest English language newspaper serving the Asian/Pacific Islander American community. It is the only print media using audited circulation and U.S. Census tract demographics to target this most affluent multicultural market. NOTE: As of January 2, 2009, AsianWeek has ended its print version and will continue as an online-only publication. It is a not for profit magazine with an all-volunteer staff. It covers Asian Americans in Texas, Kansas and Minnesota, not just the critical mass living in California and New York. It would feature emerging artists, thinkers and doers, not only the few established Asian Americans who'd gotten mainstream approval. It would be a magazine that looked beyond identity — we'd explore cultural issues while tackling what is Asian American by accident, by tangent or by happenstance. Audrey is the premier bimonthly English-language magazine highlighting the stories that interest Asian American women nationwide. Each issue is packed with glossy photos, as well as entertaining and informative articles on the latest fashion and beauty trends, celebrity news, health, dining, home décor, relationships and more. Audrey launched in March 2003 in response to the growing demand for a high-quality publication that serves Asian American women. The publisher opted to name the new venture in honor of his daughter and to recognize that many Asian American women have English names. With just 10,000 copies, Audrey has received an overwhelmingly positive response from readers across the country, and has been featured on Good Day L.A. and CNN Headline News, as well as in The Los Angeles Business Journal. Audrey Magazine is distributed at Borders Books, Barnes & Noble, B. Dalton, Tower Records & Magazines and at independent bookstores and newsstands across the country throughout the country. "Knowledge is Power, Knowledge is Pride." This statement is the founding principle behind Asians in America (AIA). Our sole purpose is to be a central source of information for all things of interest to people of Asian Pacific descent living in the United States. Connecting Asian American Women to the world. Korean Quarterly is a non-profit/volunteer publication that provides independent and alternative reporting on issues of identity, racism, politics and the arts and is a forum for the ideas and creativity of the whole Korean American community. For ten years, Korean Quarterly has been the publication of record for the Korean American and adopted Korean communities. Celebrating its 80th anniversary this year, the Pacific Citizen is an award-winning Asian Pacific American semi-monthly newspaper with a distribution of 30,000 throughout the United States and Japan. Its popular Web site averages over 450,000 hits per month. Published by the JACL (www.jacl.org), the nation's oldest and largest APA civil rights organization, the Pacific Citizen is committed to delivering the most incisive coverage of important APA stories that are often ignored by other media outlets. A blog focusing on both positive and negative portrayals of Asians and Asian Americans in mass media and popular culture. ImaginAsian Radio (iaRadio), “the sound of Asian America,” is a pan-Asian radio station that features Asian American music, entertainment news, live performances, talk, and interviews. Through 24-hour internet radio streaming, iaRadio provides established and up-and-coming Asian American artists with access to a global audience. In addition to streaming internet radio, iaRadio offers syndicated programming on terrestrial radio in forty markets throughout the United States. An authoritative, one-stop information resource and sociological exploration of the historical, demographic, political, and cultural issues that make up today's diverse Asian American community. The Asian American Justice Center is one of the nation's leading experts on issues of importance to the Asian American community including: affirmative action, anti-Asian violence prevention/race relations, census, immigrant rights, immigration, language access, television diversity and voting rights. Our expertise is widely acknowledged: in the media, by the public and lawmakers at the very highest tiers of government. The Asian American Writers' Workshop is a national not-for-profit arts organization devoted to the creating, publishing, developing and disseminating of creative writing by Asian Americans. The Asian & Pacific Islander American Health Forum (APIAHF) is a national advocacy organization dedicated to promoting policy, program, and research efforts to improve the health and well-being of Asian American, Native Hawaiian, and Pacific Islander (AA, NHPI) communities. Founded in 1986, APIAHF approaches activities with the philosophy of coalition-building and developing capacity within local AA, NHPI communities. We advocate on health issues of significance to AA, NHPI communities, conduct community-based technical assistance and training, provide health and U.S. Census data analysis and information dissemination, and convene regional and national conferences on AA, NHPI health. The Asian Pacific American Institute for Congressional Studies (APAICS) is a national 501(c)(3) non-profit, non-partisan educational organization based in Washington, D.C., that strives to pursue a mission of increasing participation of individuals of Asian and Pacific Islander heritage at all levels of the political process, from community service to elected office. Founded in 1994 by former Secretary of Transportation Norman Y. Mineta, APAICS serves as an informational resource to Congress about the Asian Pacific American (APA) community, and as a base for the development of a politically active APA citizenry. The Committee of 100 is a national non-partisan organization composed of American citizens of Chinese descent. Each member has achieved positions of leadership in the United States in a broad range of professions. With these diverse backgrounds, members collectively pool their strengths and experience to address important issues concerning the Chinese-American community, as well as issues affecting U.S.-China relations. The Media Action Network for Asian Americans (MANAA) is a non-profit organization and receives neither direct financial support from the government nor any media corporation. Founded in 1993, NAWHO has served as a powerful voice for the health of Asian American women and families. We have provided research and information about the health of Asian Americans to the public health field, as well as critically-needed health education to the Asian American community. Through innovative programs and groundbreaking partnerships, NAWHO has broken the myth of the Asian American “healthy model minority” – improving breast cancer screening outreach, increasing awareness of diabetes risk, and closing the gaps in immunization coverage. Viewed as a results-oriented organization that is able to create innovative solutions and carry out new strategies for change, policy makers and opinion leaders have time and again recognized NAWHO as an effective leader in Asian American health. National CAPACD is the first national advocacy organization dedicated to addressing the community development needs of diverse and rapidly growing AAPI communities. It is a membership-based network of more than 100 organizations and individuals in 17 states that serve Asian Americans, Pacific Islanders, Native Hawaiians, refugees and immigrants nationwide. Our members use innovative affordable housing, community development, organizing and planning strategies to improve the wellbeing of low-income AAPI communities. Founded in 1973, OCA is a national organization dedicated to advancing the social, political, and economic wellbeing of Asian Pacific Americans in the United States. OCA aims to embrace the hopes and aspirations of nearly 12 million Asian Pacific Americans in the United States. The Southeast Asia Resource Action Center (SEARAC) is a national organization advancing the interests of Cambodian, Laotian, and Vietnamese Americans through leadership development, capacity building, and community empowerment. We were founded in 1979 as the Indochina Refugee Action Center (IRAC) to facilitate the relocation of Southeast Asian refugees into American society and foster the development of nonprofit organizations led by and for Southeast Asian Americans. We serve as a coalition-builder and leader, carry out action-oriented research projects, and strengthen the capacity of community-based organizations such as mutual assistance associations (MAAs) and faith-based organizations (FBOs). We also foster civic engagement among Southeast Asian Americans, and represent our communities at the national level in Washington, DC. NAPAWF is the only national, multi-issue APA women's organization in the country. NAPAWF's mission is to build a movement to advance social justice and human rights for APA women and girls. Founded in 1981, the Asian American Journalists Association (AAJA) is a non-profit professional and educational organization with more than 2,000 members today. AAJA serves Asian Americans and Pacific Islanders by encouraging young people to consider journalism as a career, developing managers in the media industry, and promoting fair and accurate news coverage. The Asian Professional Exchange (APEX) is a 501(c)(3) non-profit, non-partisan community based organization with multifaceted goals and purposes that are charitable, cultural and educational in nature. The National Association of Asian American Professionals (NAAAP) is a 501(c)(3) non-profit organization that cultivates, supports, and promotes Asian American leaders. NAAAP offers professional development opportunities on the local and national level, engages its membership in community service, and organizes professional networking events. Through NAAAP, members work together to enhance leadership in their careers and communities. The national association of Asian Pacific American (APA) attorneys, judges, law professors, and law students provide a national network for its members and affiliates. NAPABA advocates for the legal needs and interests of the APA community and represents the interests of over 40,000 attorneys and approximately 58 local APA bar associations, with practice settings ranging from solo practices to large firms, corporations, legal services organizations, non-profit organizations, law schools, and governmental agencies. The National Association of Professional Asian American Women (NAPAW) is a nonprofit/nonpolitical organization established in August of 1987. It is organized and operated exclusively for educational and training purposes. Established in 1994, the Asian American Business Development Center, Inc. (AABDC) is a 501(c)(3) non-profit organization whose mission is to assist Asian-owned businesses to compete in the mainstream marketplace. Founded in 1979, Asia America MultiTechnology Association (AAMA), formerly known as Asian American Manuafacturers Association, is Silicon Valley’s largest and most established non-profit organization dedicated to the Asia American high-tech community. Having deep roots and a wide reach in the local Silicon Valley community and across Pacific Rim countries, as well as a proven track record of success as a Silicon Valley-based organization, AAMA expanded into China by launching chapters in Beijing and Shanghai to better serve as the bridge between Silicon Valley and Asia. Each chapter hosts events to localize the effort to promote business relationships and works closely with Silicon Valley headquarters to ensure members realize the maximum benefit of the organization. The US Pan Asian American Chamber of Commerce (USPAACC) was formed in 1984 as a national, non-profit organization representing all Asian Americans and Asian American-related groups in business, sciences, the arts, sports, education, public and community services. USPAACC represents multiple ethnic groups. Founded in 1995, Asian Women In Business (AWIB) is the only non-profit, tax-exempt organization in the country with the primary mission of assisting Asian women entrepreneurs. Over the years, AWIB, a dynamic organization, has expanded its mission to address identified needs and issues affecting the business and professional development of Asian Americans. AWIB also serves on various tasks forces and boards to promote the inclusion of minority and women owned businesses and professionals. The SBA strives to reach those sectors of the population currently underserved by its programs, including ethnic populations, women, veterans, and both urban and rural businesses. They have identified resources that offer opportunities and assistance. Part of the U.S. Department of Commerce, specifically created to encourage the creation, growth and expansion of minority-owned businesses in the United States. MBDA provides access to public/private debt and equity financing, market opportunities, and management and business information; coordinates and leverages public and private resources; and, facilitates strategic alliances. Welcome to the Student Digital Exhibition of the Japanese American Relocation Centers Records at Cornell University. Here you will find select primary documents from the Japanese American Relocation Centers Records accompanied by student historical analysis. The exhibition is a part of a class project from two courses taught by Dr. Chrissy Yee Lau, including AAS 2130: Introduction to Asian American History and AAS 3470: Asian American Women’s History. This class project comes out of collaboration between the Asian American Studies Program and the Rare Manuscript Division. This digital exhibition is organized by major themes that students found when digging through the Japanese American Relocation Centers Records archive, including Issei and Nisei Generational Differences, Women’s Experiences, Gender Relations, Family Dynamics, Politics of Food, Community Governance, and Recreation. Students selected their own primary documents and underwent several rounds of peer review in order to provide an honest and informed analysis of these themes. The goal of this digital exhibition is to bring public attention to the historical documents located at this unique archive and to offer an analytical insight, with attention to race, gender, class, and generation, into the incarceration experiences of Japanese Americans during World War II. Please enjoy this Student Digital Exhibition! 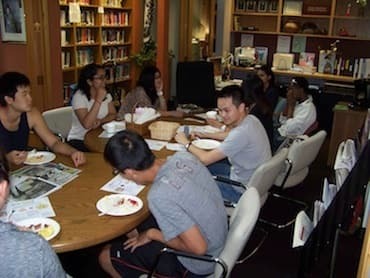 To assist their analysis of the Records archive, students utilized the wide range of secondary sources from the Asian American Resource Center. Here is the list of notable publications exploring the topic of Japanese American Incarceration.